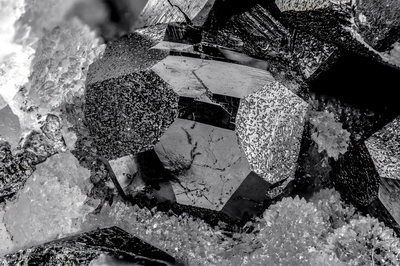 A tetrahedrite crystal, bright, black, with the rather broad and mottled faces of rhombododecahedron and those of the brightest tetrahedron and finally, looking at the left side of the crystal, a cube face (narrow black stripe) and a rather developed tristetrahedron . On small quartz crystals. Collection and photo of Gianfranco Ciccolini. Nikon D750, bellows, Luminar 40 mm.